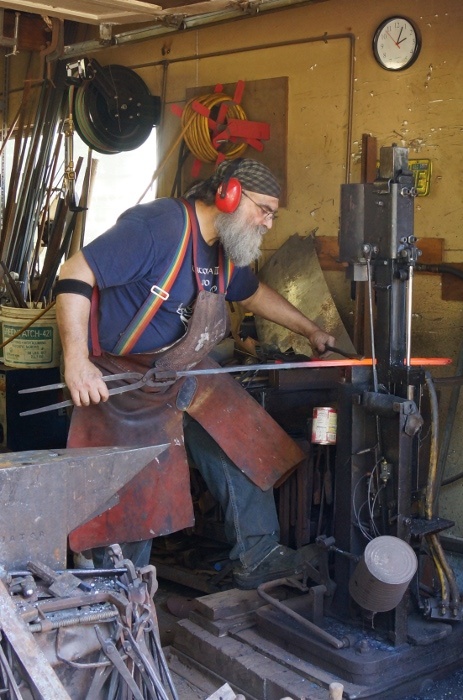 First stop, Red Troll Forge in Vancouver, WA for blacksmithing lessons with the talentend and ever-patient Grendal. 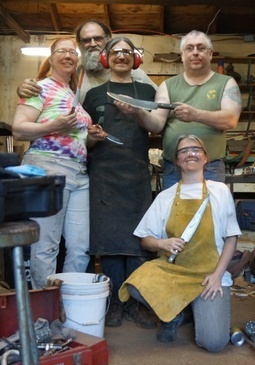 The objective was to make Damascus-style steel knives: four of them, in three days, with four students (me, Eric, Chris, and Sue) and one awesome teacher. 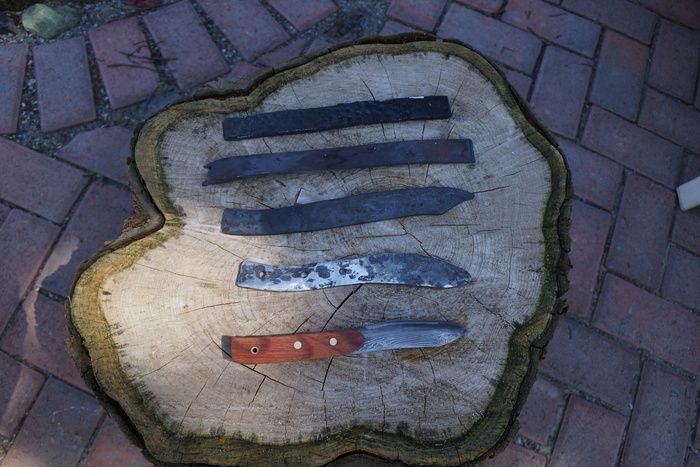 Step one: get six plates of carbon steel and five plates of steel with nickel, and grind off all oxidation. Ideally, the surfaces would be mirror-smooth and shiny, but the metal oxidizes too quickly to polish, so ground more-or-less smooth and shiny is good enough. 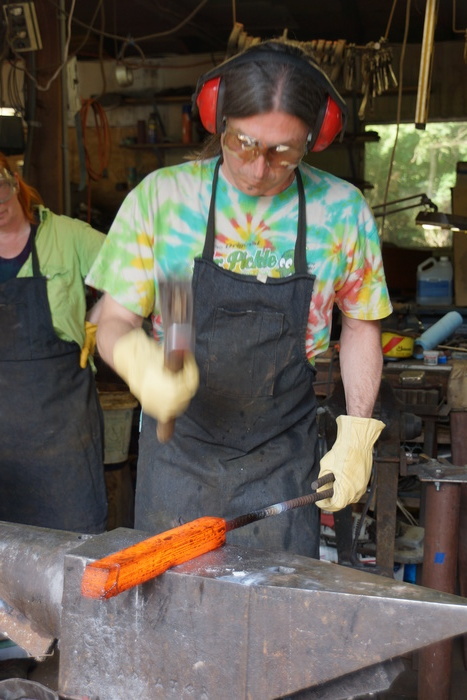 The pieces are then stacked in alternating layers, and held in a vice for a rebar handle to be welded on (the handle isn't strictly necessary - in fact, I found it easier to manoever once the handle was off, because I could then hold it closer to the center of its weight). The other end is secured with wire (it can't easily be welded, because the bars aren't all the same length). This stack is then dipped in kerosene (which seems to help keep it from oxidizing while it heats up), and then stuck in the forge and heated until it becomes orange hot. It is then dusted with flux (Grendal uses borax) and heated again until the surface becomes tacky when tested with a rebar test rod. Next step: forge welding! 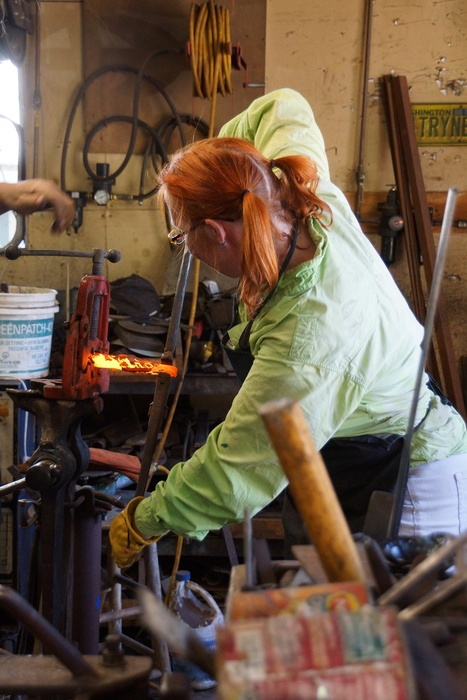 Turns out, if you heat pieces of steel to orange-hot and then whack them with a hammer, they will weld together. 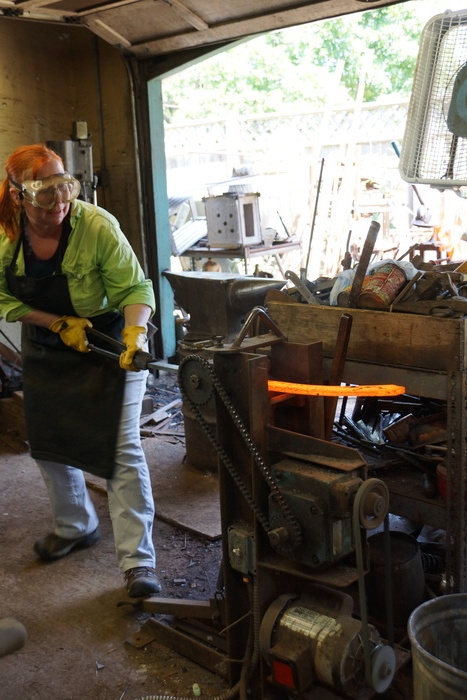 This is really fun - you can feel that the hammer is striking a stack of metal, and then after a couple of whacks the ringing of the stack turns to the dull thud of a solid bar. The metal needs to be very hot for this to work, so we did it in three stages - near end, middle, and far end. Between each step the old flux was scraped off with a brush, and then the metal was re-fluxxed and re-heated. The next step is to flatten the bar out so it can be folded (or, in this case, cut and restacked). This can be done with an ordinary hammer and anvil, but the power hammer saves a lot of sore backs and rotator cuff injuries. However, the power hammer is NOT an easy instrument to use. The control is a foot pedal, and it's very easy to go from tapping too lightly to squashing the piece into a lump of red-hot abstract art. The idea is to feed the bar into the power hammer an inch or so at a time, flattening the stack by a quarter inch or so in each pass. 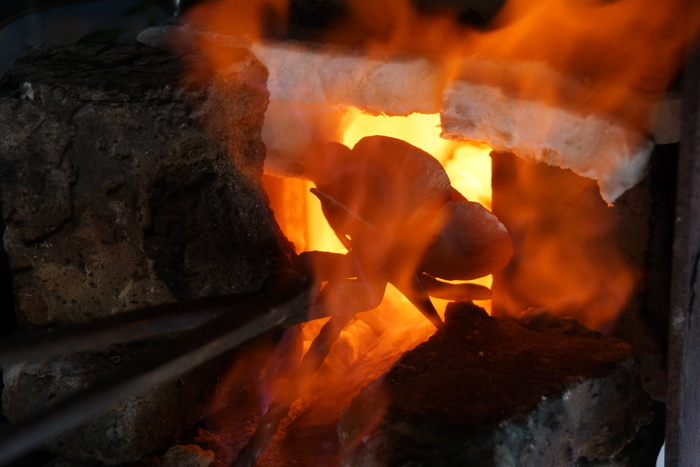 The bar stays hot longer in the power hammer because of the extra energy being fed into it, but there's still a fair amount of reheating in between. Once it got down to an inch or so thick, we switched to the rollers. The foot pedal moves the rollers closer together, squishing the metal bar in between. The bar tends to curve a bit as you do, but when you flip it over it tends to curve the other way, thus straightens itself out. The piece really looks like a sword at this point. 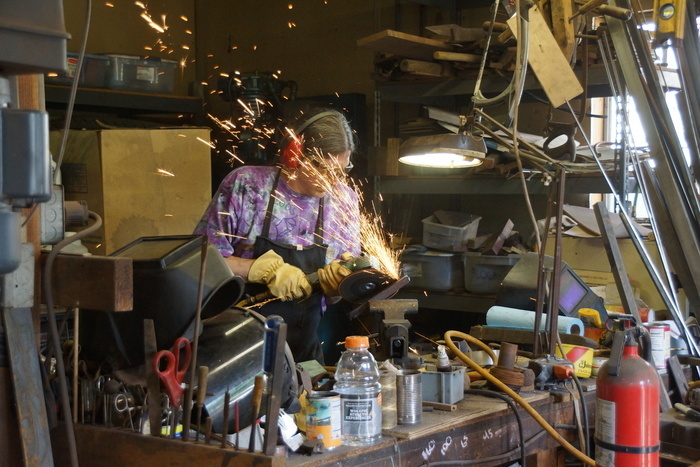 Sue is using one of Grendal's many custom-made tools - in this case, a plier-like set of grippers with a rectangular trough on one side. 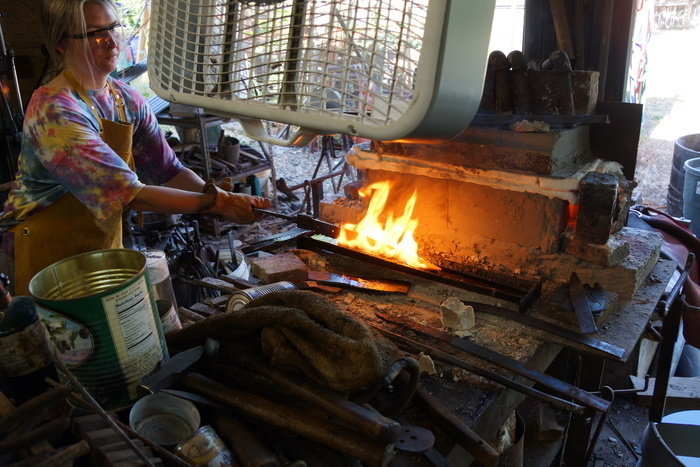 One thing about working in a forge is that if the tool isn't quite right for the job at hand, Grendal just reworks the tool until it is quite right. 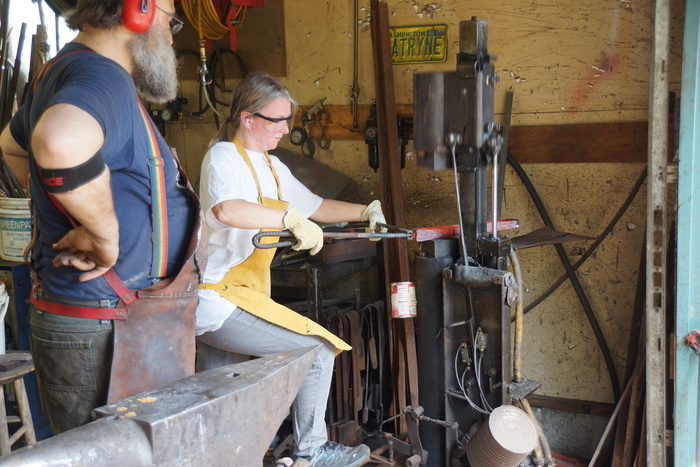 We then ground the accumulated carbon off of them so they could be restacked, with two new higher-nickel layers in between (otherwise they would have a double layer of carbon steel in the middle), and repeated the forge-welding process to weld the new stack. 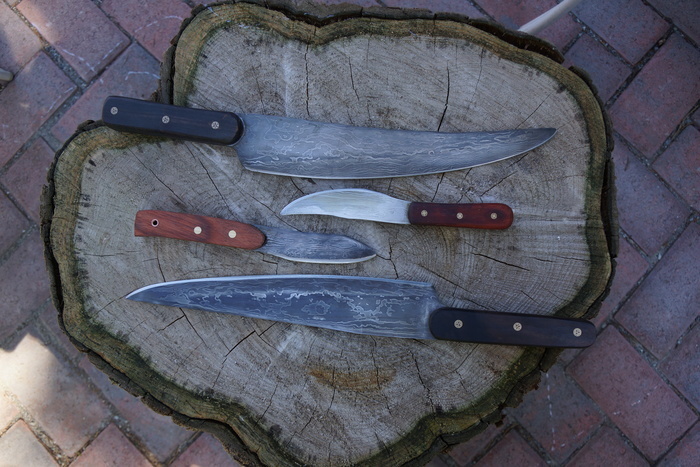 This re-stacking process is what gives Damascus steel its layers. There are different patterns you can put into Damascus steel. 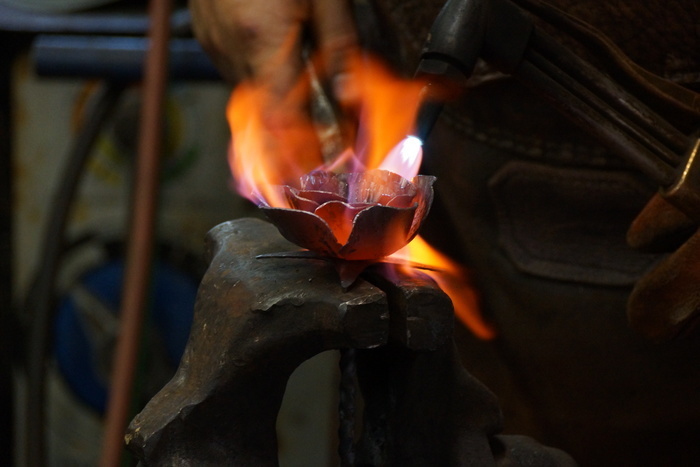 One option is to re-form the metal into a squared rod, and then twist it. The twists are then flattened out, so you have to put quite a few turns in to make them visible in the finished piece. Another option is to pound in a pattern, which will mean that different layers are on the surface of the piece when it is ground smooth. The piece is then flattened again, to about twice the thickness of the knife, and given its basic shape. Grendel did the shaping with the power hammer - I have the feeling it's one of those steps where errors are harder to undo. The next step is to put a tip and an edge on the knife. The tip is shaped using the hammer, alternating between hitting the thin edge (to shape the point) and the flat sides (to keep the metal from wadding up). 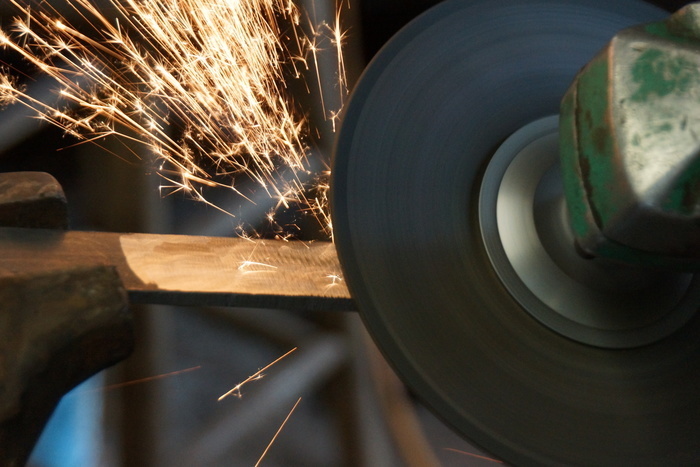 The edge can be done either by hammering or grinding. Hammering leaves more of the Damascus pattern on the edge, where grinding shows more of the layers. When hammering in an edge, the general idea is to hit each side at about a 15 degree angle, starting at the tip and working your way back. 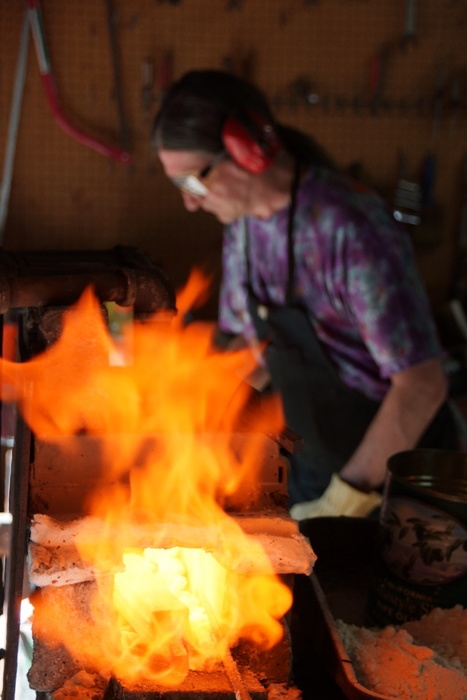 If the metal is hot enough, and you hit it hard enough, you can see it slowly take shape under the hammer. After that, it's more grinding - to flatten out the irregularities introduced in the previous steps. Once the knife is basically smooth, the edge can be tempered. 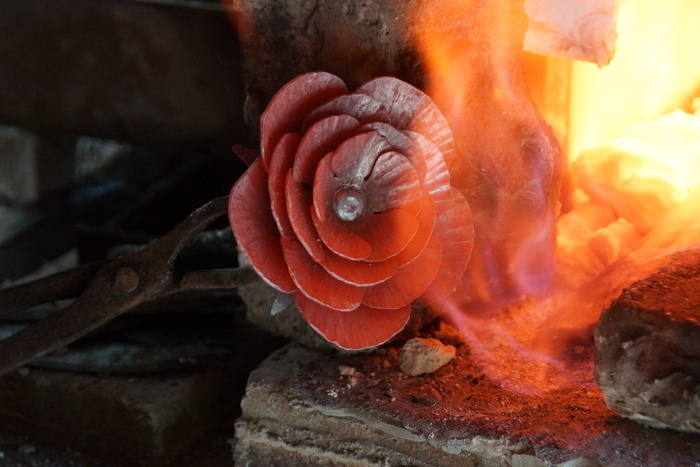 This is done by heating the knife to a dull red hot, then dipping the edge in oil. The oil will cool the edge to about 400F (its smoke point). 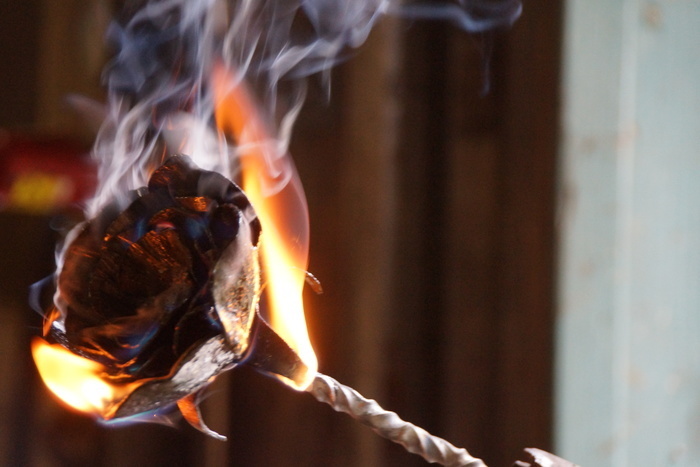 Once the oil has stopped catching fire and smoking, the knife is briefly reheated in the forge, and then set with its edge in the oil to slowly cool. Once it's cooled, all that's left is polishing with sandpaper, and putting on a handle. In our case the handles are wood and each held on with three glued pins. The proud students and their patient teacher. The unfinished pieces (and one finished one) showing the various stages. The top one is a metal bar, in need of some further flattening before it gets an edge. The next one has been flatted to about the right thickness. The next one has had its tip shaped and the beginnings of an edge added. The next one has its basic shape and is being ground down. The last one is one of our finished pieces (made with the twisted metal). This is the project Grendel was working on, in between keeping us out of trouble. 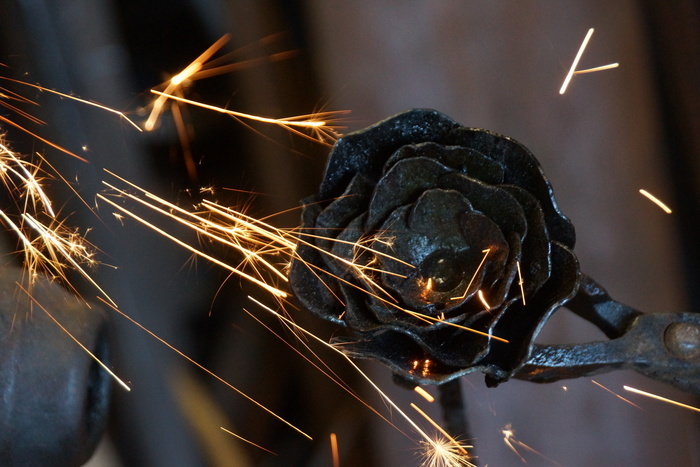 Grendel keeps the petals hot with a blowtorch to shape them. Dipping the finished piece in wax gives it a black, iridescent sheen. The rose and the spark.